4-Plow knife of filter tank separated to one foot, feet and bow plow knife 5-Wort boiling heat way includes steam jacket, interior heating and exterior heating. 6-Material includes stainless steel 304, 316 and red copper Whether your in need of additional Fermenters or Bright Tanks for your existing brewery, or need an entire Brewhouse we have you covered. Our 3 top-level technicists worked in this business over 10 years, 2 senior engineers worked over 8 years, workers average production experience is 3 years. Mirror polishing and wire drawing SUS 304 for optional,thickness:2-3mm Rational layout, Humanized design and convenient operation METO Beer Brewery Equipment is made of high-quality SUS304 stainless steel and can be customized according to customer's requirements and budget with standard configuration & high configuration. Chiller 5HP 380V Refrigerant: Freon R404A ,R410A Pump 3T Power: 0.75kW;lift:18M Cleaning System Disinfection Tank 100L SUS304 full welded; Thickness: 2mm Alkali Tank 100L SUS304 full welded; Thickness: 2mm Pump 3T Food grade centrifugal pump 3M3/Hr; 0.75kw Control System Control Cabinet Manual/PLC/HMI Manual/semi-automatic/Automatic Products:Brewhouse Inner ( SUS304 Stainless Steel Wire Drawing Board ) thickness: 3.0mm External(SUS 304 Stainless Steel Wire Drawing Board ) thickness:2.0mm Insulation:Polyurethane-thickness:80mm. Mash tun, Lauter tun, Boiling Kettle, Whirlpool tun in various combination Equipment with tangent tube Easyclean and detachable sparging ball 360&deg; coverage CIP spraying ball Stream heating,dimplate plate steam-jackets&rsquo; thickness:3mm Equipped with: Grain rake and agitator Temperature measurement:Temperature Probe PT100 Food grade centrifugal pump (VFD) Infusion and decoction mashing process Fermentation Tank Inner ( SUS304 Stainless Steel Wire Drawing Board ) thickness: 3.0mm External(SUS 304 Stainless Steel Wire Drawing Board ) thickness:2.0mm Insulation:Polyurethane-thickness:100mm. If customers need,we can do on-site installation for our brewery system. If customer needs, we can appoint our engineer for the installation. The work includs equipment installation, training and first batch brewing. We always believe the passion of beer is most important for the beer business, we are a turnkey solution of craft brewery project. Our service for 500L beer brewing equipment: 1. Free installation, design the layout. 2. Teach you brewing beer, provide more than 10 kinds of beer receipt for free. 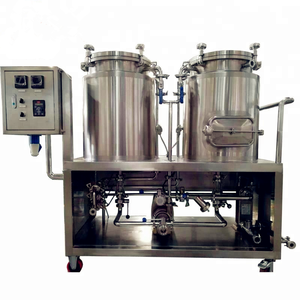 :) The 50L beer brewing equipment is widely used in pub, laboratory, home. 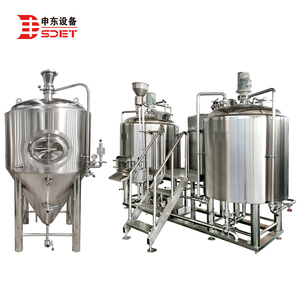 The beer brewing equipment of Ice water tank, belong to cooling system. 1. Can your beer brewing equipment make both lager and ale9 A: Yes, our beer brewing equipment can make both lager and ale. 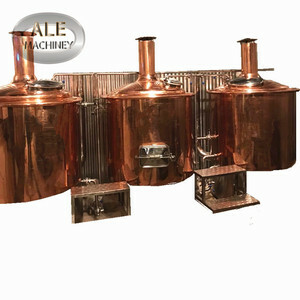 Alibaba.com offers 15,352 500l brewery equipment products. About 93% of these are fermenting equipment, 5% are other beverage & wine machines, and 1% are filling machines. A wide variety of 500l brewery equipment options are available to you, such as alcohol, carbonated beverage. 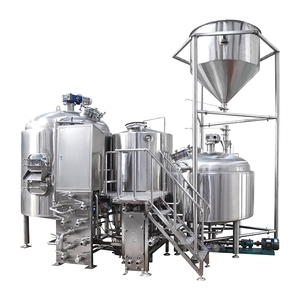 There are 15,270 500l brewery equipment suppliers, mainly located in Asia. The top supplying countries are China (Mainland), Ukraine, and India, which supply 99%, 1%, and 1% of 500l brewery equipment respectively. 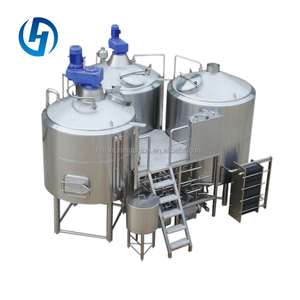 00l brewery equipment products are most popular in North America, Domestic Market, and Western Europe. You can ensure product safety by selecting from certified suppliers, including 9,736 with ISO9001, 2,327 with OHSAS18001, and 2,293 with Other certification.